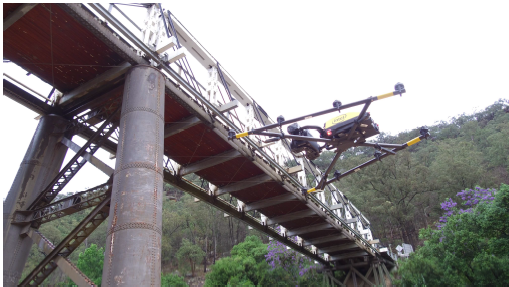 Will drones revolutionise bridge inspection? There are now over 900,000 kilometres of roads and over 50,000 bridges in Australia. Millions of commuters rely on the transportation network. The reliability and safety of these infrastructure elements are crucial to the Australian economy. To ensure the desired serviceability of the asset components and required level of safety is maintained, it is critical that detailed information about the bridge deterioration be recorded. Further analysis of the gathered data enables the asset manager to identify the deterioration rate and pattern and therefore, allocate resources for maintenance or remediation work. Currently, bridges are inspected through conventional methods including traditional bridge access methods such as under-bridge inspection units, mobile scaffolding, boom lifts and cherry pickers; for all, traffic control is a prerequisite. Whilst this approach to bridge inspection facilitates inspection to be undertaken close to the point of interest in the structure, it requires considerable time for planning and execution and is also very resource intensive, as well as causing interruption to traffic flow in some instances. Remotely Piloted Aircraft (RPSs) - commonly known as drones - offer substantial potential in undertaking visual inspection with high accuracy and reduced risk to bridge crew, allowing a bridge to be visually inspected without the need for inspectors to walk across the deck or utilise under-bridge inspection units. This can significantly reduce the overall inspection costs and disruption caused to the general public. In addition to this, the use of air borne Aerial Photogrammetry enables engineers and asset managers to analyse a situation through the 3D spatial model offered by RPA systems. 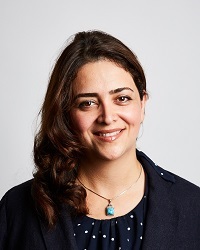 Our Structural Assessment and Health Monitoring (SAHM) team, led by Dr. Maria Rashidi, has collaborated with RMS to trial remotely-piloted aircraft (RPA or drones) for bridge inspections. As part of this feasibility study, qualified pilots from our team and RMS used a high-end drone to examine the effectiveness of RPAs for bridge inspection. Four bridges with various features and configurations have been tested to determine the effectiveness of RPAs as bridge inspection tool. This research has already sparked interest across Australia, including other states’ transportation departments. Research interests include: bridge management systems, systematic asset management for civil infrastructure, condition assessment and remediation planning of concrete bridges, managing ancillary transportation assets, lifecycle management and risk management of civil infrastructure, and development of decision support systems for infrastructure planning.